Fast repairs done right - every time! If there's a plumbing problem in your home, we'll fix it. There's a long list of things that can go wrong in any home - leaky toilets, water heaters that don't work, clogged pipes, septic problems, low water pressure. We've seen just about everything and know how to fix it all. Our repair team is available 24x7. We'll be glad to give you a free estimate. Whether you just need a new faucet or want to replace all your plumbing fixtures as part of a kitchen or bath remodel - we're the ones to call for reliable service. 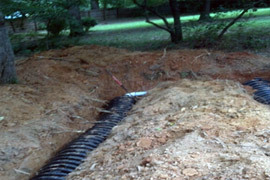 We use the latest technology for clearing and unclogging drains. Main lines, bathtubs, sinks, laundry, & rain drains, we do them all. We use special drain cleaning equipment to remove years of root growth in sewer lines and sophisticated sewer camera technology that allows you to see the problem so there is no guessing where the problem exists. There is no drain that's too tough for us! Call us today! We are experts at replacing these outdated plumbing systems. If you think you have polybutylene plumbing in your residence or business, make an appointment today with the PLUMBPROS.